There are many ways to encourage people. One approach is to make sure they are encouraged on both an emotional and economic level. Looking at the organisations in which people score highly on wellbeing, for example, many of these provide good economic conditions. This enables people to climb higher on Maslow’s hierarchy of human needs. People obviously need to take responsibility for shaping their future lives. They also need to be given emotional encouragement, however, and the chance to learn from positive models. They will then be more likely to thrive. 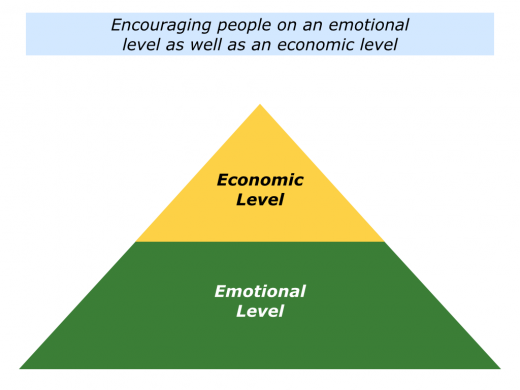 Looking at your own life and work, when has somebody encouraged you on an emotional level? They may also have done things to encourage you on an economic level, but the main memory you have is that of feeling supported. What did the person do to encourage you? They may have helped you to feel the centre of their world, highlighted something you did well or shown a practical way you could shape your future. What did you feel like afterwards? 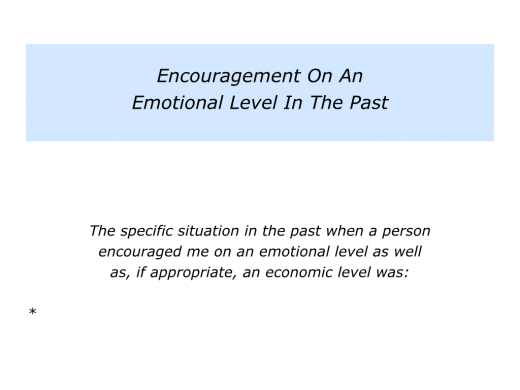 Describe a specific situation in the past when a person encouraged you on an emotional level as well as, if appropriate, an economic level. 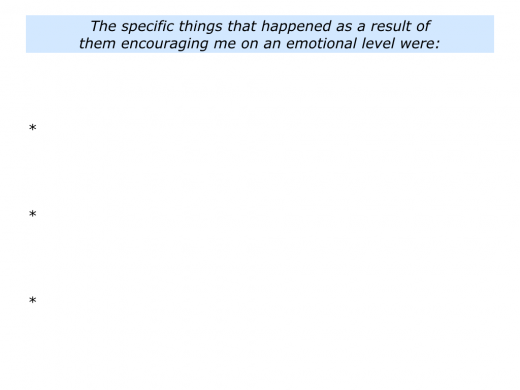 Describe the specific things they did to encourage you on an emotional level. 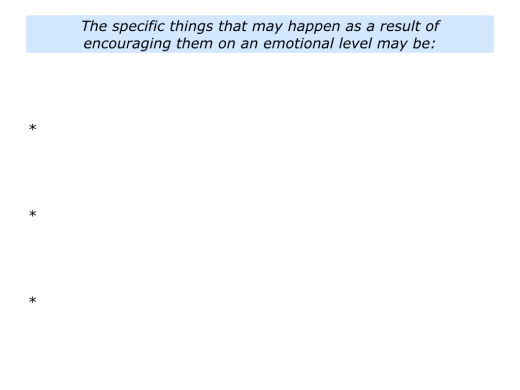 Describe the specific things that happened as a result of them encouraging you on an emotional level. During the 1990s I helped to design a programme that enabled people in a large company to build on their strengths. The programme contributed to helping the company to be voted the best place to work in their country. One ingredient was providing one-to-one sessions for over 200 people to help them shape their future work. Whilst their strengths were the focus for the sessions, people were also simply given the opportunity to talk about themselves. They reported some of the following things. What worked during the process? The strengths approach played its part, but the key was showing people they were valued. They were also provided with practical tools they could use to shape their future careers. 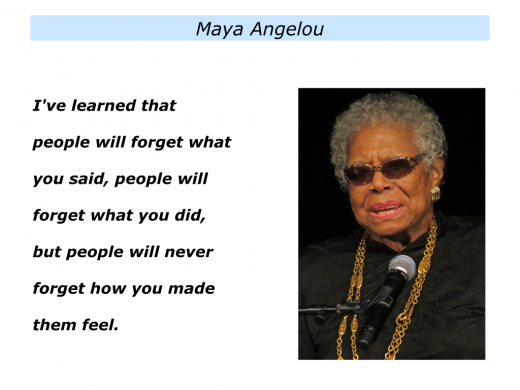 Good leaders encourage people on an emotional level. They build and maintain a positive culture in which motivated people can achieve peak performance. Such leaders make other people feel important, rather than make themselves important. They do this when meeting people individually, with teams or when communicating with big groups. They continually focus on the people aspects, rather than just talking about products and profits. 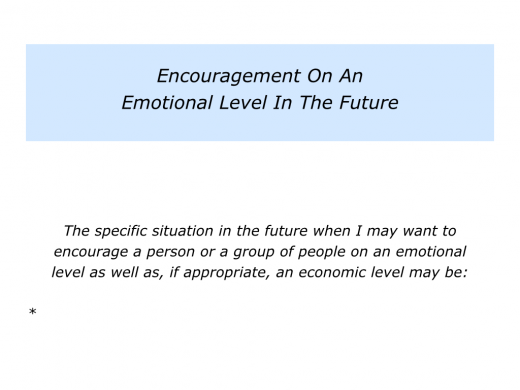 Looking to the future, can you think of a situation when you may want to encourage a person or a group of people on an emotional level? You may want to do this when acting as a parent, friend, teacher, coach, mentor, leader or whatever. 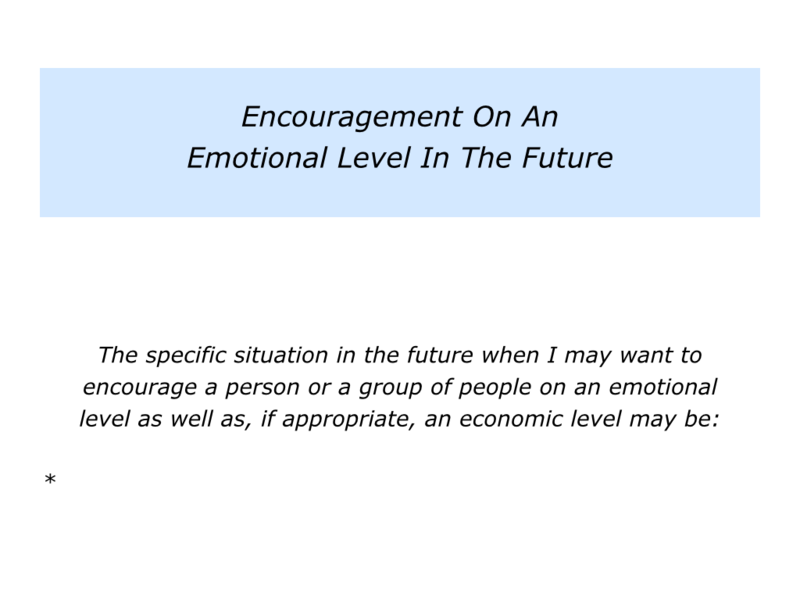 Describe a specific situation in the future when you may want to encourage a person or a group of people on an emotional level as well as, if appropriate, an economic level. Describe the specific things you can do then to encourage them on an emotional level. Describe the specific things that may happen as a result of you encouraging them on an emotional level.